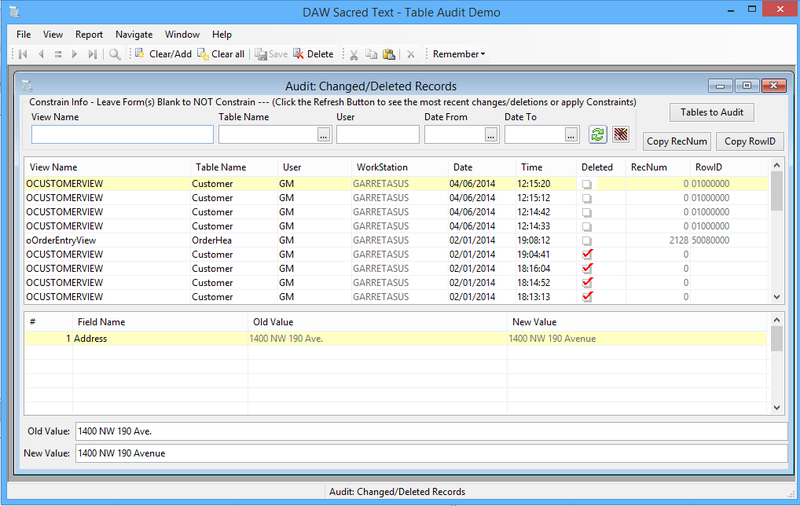 The attached Order Entry example workspace contains a DataDictionary based subclass that allows you to easily add auditing to your DataFlex based applications. Either add the subclass and base your DD's on it, or add the code to your DataDictionary subclass. This workspace was demoed at DISD 2014 and is shared here because other developers showed interest and wanted to know how it was done. Of course this means that the code will only audit datadictionary based changes. If you have decided to update records with procedural code then those changes will not be audited. The workspace has been tested with Visual DataFlex 17.x and DataFlex 18.0 (beta) and with the embedded database as well as MS SQL Server 2008R2. Note comments in the code if you use MS SQL Server and choose to use Identity fields for ID's. The other view of interest is the actual auditing screen. This screen quickly lets you see what has changed & has functionality for drilling down on the specific records that you are looking for. Note that you will need to connect to your login/user identification system to get User information. Please note that there are dependencies in the subclass and views that come from other projects. Please check your versions before copying any of these files so you don't overwrite newer versions! I also recommend that you be careful what you audit. 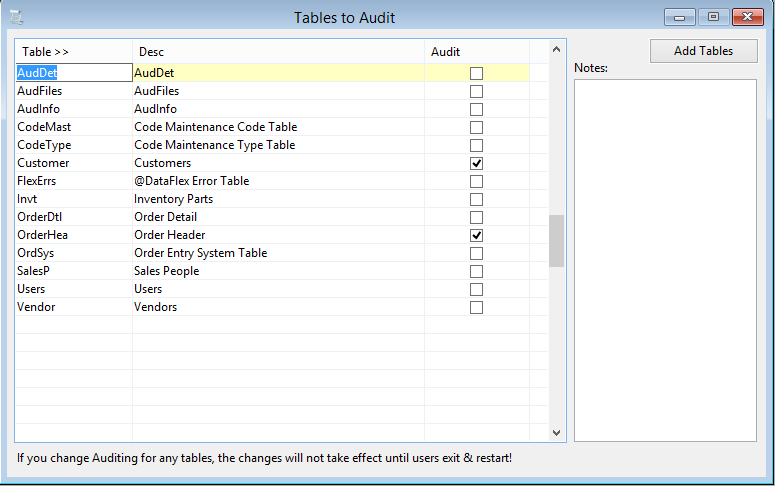 Auditing a table that gets changed a lot can create many records in a big hurry!